Hand Rejuvenation– Individually or in combination, Voluma, Fraxel Restore Laser, Intense Pulsed Light (IPL) and recommended skin care products can make your hands look younger and more beautiful. We have a new protocol that will make you want to show your hands again. Schedule a consult or ask us for a handout and pricing information. Bellafill for Acne Scars- Bellafill is a permanent filler FDA-approved to treat acne scars. Skin testing 1 month prior is required. 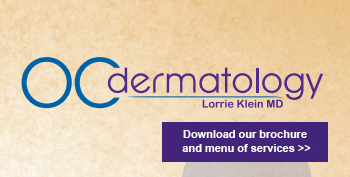 Call us to schedule your consult and skin test today. UltraShape Body Contouring- OC Dermatology is one of the first practices in the U.S. to have UltraShape, a new, painless way to remove fat. Call to schedule your FREE consultation. New Products! At Euro Day Spa, just in time for Mother’s Day, we now have Lalicious Sugar Scrub, Body Butter, Hand Cream and Lip Butter in 4 scrumptious flavors- an AWESOME gift. At OC Dermatology we now have Alpha-Lash, our new eyelash enhancer. Dr. Klein highly recommends applying it on top of Latisse, the 2 together grow your lashes longer AND thicker! We also have Alphaeon Growth Factor Serum. Dr. Klein loves this product in the PM, while using SkinMedica TNS Essential Serum in the AM. UltraShape Event Wednesday May 6th. Free consults all day plus 20% off all treatments purchased that day. Buy 3 or more treatments and receive a HydraFacial MD treatment FREE ($179 value). Bring a friend and you’ll both receive free SkinMedica products. Call 949-363-1788 to schedule your consult or just stop by. Spring Cleaning! Bring in your old skincare products and get big discounts on SkinMedica Products! 4 old products … $120 off the purchase of 4 SkinMedica products PLUS a free Vitalize peel! Free Illuminize Peel ($125 value) with the purchase of a Mother’s Day Spa Gift Card of $150 or more. Purchase any of these popular regimens and receive 20% off PLUS your choice of a FREE “Everything Mini” Travel Set of Products ($79 value) or make-up Brush Kit ($50 value)! These regimens combine fantastic skincare products with makeup essentials. Many of you know Tenaya, our Beauty Bar Consultant and checkout receptionist at OC Dermatology. This month we are featuring one of Tenaya’s favorite product: ColoreScience SunForgettable Powder Sunscreen SPF 50. All Beauty Bar MD Members receive 20% off this product this month. Dr. Klein likes to pair SunForgettable SPF 50 powder Sunscreen with her favorite procedures and products: SkinMedica TNS Essential Serum, SkinMedica Lytera Complex, ColoreScience EvenUp, Fraxel Laser and VBeam Laser. Stop by to learn more about our newest product: Even Up by ColoreScience- a foundation, sunscreen and lightening product all-in-one!